From mild to WILD in 30 days... the build begins! Well I finally started on the RC today to get it ready for the HEMI truck shootout in Tulsa on April 15th. The truck is pretty much bone stock right now. It has a Flowmaster (which is not staying on the truck), K&N drop in filter, and Superchips. #1 on the list is having the 4-link rear suspension installed. 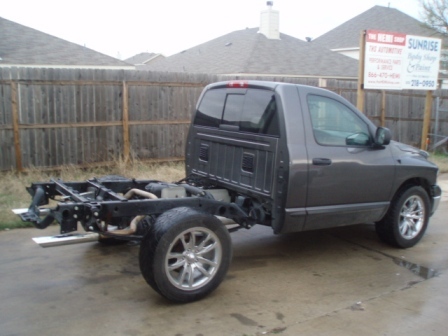 I pulled the bumper & bed off today and will be swapping the SRT10 Dana "super 60" rear axle into it tomorrow. I also have to install the DJM 3" drop control arms and drag shocks for the front. I'll do my best to keep you guys posted with updates! Modern Hemi... Why doen't people build them? HOT! Leaked Challenger Build Photos! Where did all the new users that joined this forum in the last few days go? Why did the admins delete them?? Quick Reply: From mild to WILD in 30 days... the build begins!